1958 Roads to Romance Map, Southern California - theVintageMapShop.com - the Vintage Map Shop, Inc. 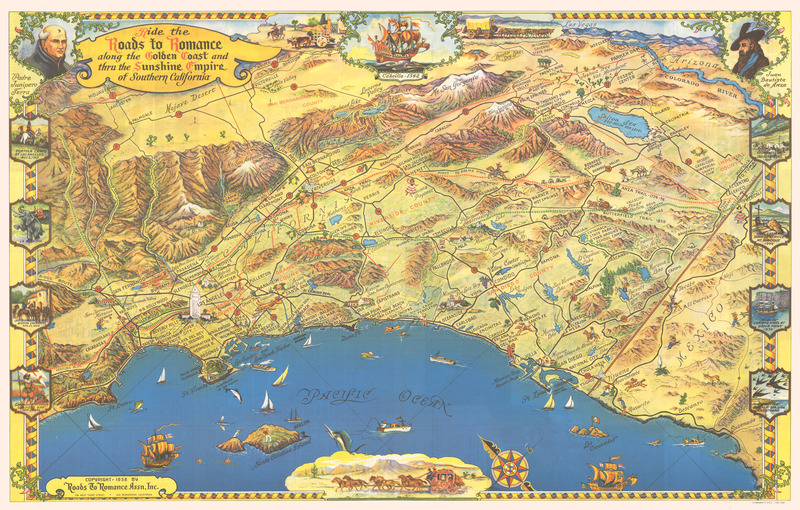 This is a reproduction of a vintage pictorial road map of Southern California drawn by Claud G. Putnam for Roads to Romance Inc. The Roads to Romance series ran from the 1940's to the 1960's of which this example was published in 1958 in San Bernadino California. This spectacular pictorial map extends from Mojave4 and the San Fernando Valley to Lake Havasu, Arizona and Ensenada, Mexico. The focus of the map is to highlight their remarkable highway system and all the accessible attractions that can be discovered throughout Southern California. The map is surrounded with a decorative border featuring several historic events and natural highlights and phenomena of the area, including dinosaurs succumbing to tar pits, Cabrillo’s discovery of San Diego Bay, the founding of San Bernadino, and swallows arriving at San Juan Capistrano, to name a few. Adorning the upper corners of the map are portraits of Juan Bautista de Anza and Padre Junipero Serra.